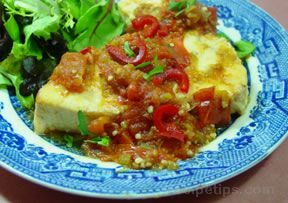 Tangy salsa makes an ideal accompaniment for mild flavored fish in this quick recipe. Have the rest of the meal nearly ready before cooking the fish, since it will only take a few minutes. Lightly salt the fish and cut into serving-size pieces. In a 12 inch skillet over medium heat, bring the salsa to a boil. Add the fish fillets, reduce the heat and simmer until the fish flakes easily with a fork and is opaque at the center. This may take 5 minutes or longer, depending on the thickness of the fish. Serve immediately. Garnish with chopped parsley or cilantro, if using. This is good served with rice or taco chips and a green salad.